Our 1st and 2nd class children had a fantastic time at our ‘National Flag Ceremony’ yesterday. 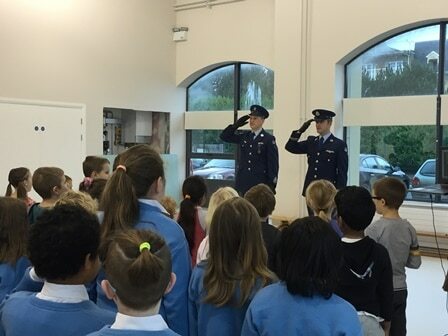 A lieutenant and a sargent from the Air Corps visited our school and Citywest ETNS to present us with our flag. They asked the children lots of questions about our Irish flag and the children answered brilliantly! They spoke to us about the significance of the flag and really got us excited about our shared identity – our Irish identity. They also taught us how we have to look after the flag when they left. They read out the ‘Irish Proclamation’ which set out the vision for the country. The Proclamation had a vision of peace, harmony and equality for all Irish citizens. It was really nice to see how this part of The Proclamation linked to our own school ethos. We look forward to writing our own proclamation very soon which will describe what we would like to see happen in Ireland over the next 100 years. The children all asked some really interesting questions and the members of the Air Corps were excellent and providing clear, understandable answers. We finished the ceremony by singing our National Anthem ‘Amhrán na bhFiann’. All of the children stood very straight with their hands by their sides during this song. The representatives of the Air Corps explained that they salute during the singing of the National Anthem. To see more pictures of our great morning, please click here.